The Green Mountain State is famous for its abundance of dairy farms, which have provided fresh, clean-tasting milk to New England for generations. Now, thanks to a new breed of farmers with sophisticated palates and mad-scientist zeal, some of these dairies are also producing delicious handcrafted cheese. These luscious creations include tangy chevres; buttery tomme-style wheels; oozing disks that recall Camembert; and pungent, creamy blues -- all inspired by European classics and tasting of the fertile earth from which they come (or at least of the grasses, herbs, and other browse that cows, goats, and sheep graze on before they are milked). Tarentaise, for instance, an Alpine-style aged semihard cheese made at Thistle Hill Farm, gets its nutty flavor and golden color from the milk of Jersey cows that munch on the nutrient-rich grasses at John and Janine Putnam's 85-acre hillside property. John, a former lawyer, left the corporate world to make one cheese and to make it well. Other cheese-makers came to their craft after falling for Vermont itself, having spent summers there as children, returned after college, or just driven through, captivated by the sylvan setting. Some, like Hannah Sessions and Greg Bernhardt, of Blue Ledge Farm, are raising young families as they are raising herds -- an all-hands-on approach to farming at its most elemental. What they have in common is a passion for the state's agrarian culture. "We were really drawn to working with our hands on the landscape," Bernhardt says. "We didn't know that we were getting into such a fast-growing food sector." Angela Miller didn't know that, either, when she started making cheese five years ago. "There's a real interest now in artisanal cheeses," says Miller, whose Consider Bardwell label is sold in specialty shops. A literary agent from New York City, Miller moved to Vermont part-time because she was "looking for a change." But she wasn't thinking about a second career that involved separating curd from whey: "I've had a lifelong passion for cheese, but I had no intention of making it." When she and her husband, Russell Glover, happened to find a rolling, 305-acre property that, in the mid-1800s, was the site of Vermont's first cheese-making cooperative, "a light bulb went on," she says. Miller took animal husbandry and cheese-making workshops, began raising goats, and produced her first cheese, a fresh, delicate-tasting patty called Mettowee, in 2004. Willow Smart and Dave Phinney keep a flock of about 90 sheep for the cheese they produce on Willow Hill Farm. This isn't a common choice -- sheep give less milk than cows or goats and are more labor-intensive to care for. But Smart loves the small animals and their wonderfully rich milk. "The richer the milk, the more cheese you can make," she says. "The cheeses tend to be more buttery. They can be peppery or nutty -- there are just a myriad of flavors." The brothers behind Jasper Hill Farm may have the most ambitious plan for ensuring that Vermont becomes a cheese-making mecca on a national, and perhaps even an international, scale. Mateo and Andy Kehler not only produce some of the finest cows' milk cheeses in this country, but they also buy, age, and sell cheeses made by dairies that don't have the resources to age and market their own products. They work with 13 other farms and say they have the capacity to handle 40. "We're interested in keeping these farms viable and helping them thrive," Mateo says. This year, the Kehler brothers and their partners put the finishing touches on a 22,000-square-foot aging facility with seven cavernous, climate-controlled cellars, each devoted to aging a particular style of cheese. One vault is just for washed-rind cheeses from small producers. Another holds 6,000 wheels of Cabot Clothbound Cheddar, each hand-coated with lard that invites just the right molds to grow during their yearlong maturation. This earthy cheddar with hints of butterscotch, a collaboration with the commercial brand Cabot Creamery, is served at the Ritz-Carlton in Washington, D.C., and the French Laundry, in Yountville, California. If all goes well, it will be sold in European shops and restaurants before long. Cash flow from this part of the Kehlers' business finances the more modest operations of cheese-makers just getting started, which fuels Vermont's hottest export since Ben & Jerry's ice cream. This is pretty big thinking for a farm that began making cheese only six years ago -- and a delicious example of how community spirit nurtures the land. "When you eat things made close to you, they always taste better," says Willow Smart. 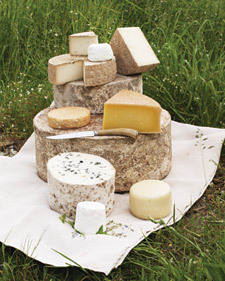 The cheese: Varieties include Summertomme, herb-crusted and buttery; Vermont Brebis, soft and tasting of mushrooms; and Alderbrook, semi-ripened, with citrus and herbal notes. "I really bonded well with the goats," says Angela Miller. The cheese: Seven kinds, four from goats' milk and three from cows'. Standouts include Mettowee, a fresh, creamy chevre, and Manchester, a rustic tomme-style cheese that's nutty and earthy. "We do it the European way: one place, one cheese. That way your cheese tastes like your farm," says John Putnam. The cheese: Tarentaise, an aged semi-hard cheese inspired by Beaufort and Abondance, from the French Alps, and made from the organic milk of the farm's Jersey cows. "People cherish the small luxuries in life, and cheese is just that," says Hannah Sessions. The cheese: Seven goats' milk varieties, including Lake's Edge, a slightly tangy melt-in-your-mouth cheese with a layer of ash, and Dunmore, a new semisoft cheese named after a nearby lake. "It knocked my socks off," New York cheesemonger Anne Saxelby says. "It's like buttercream frosting." "Our mission is to keep the landscape working," says Mateo Kehler. The cheese: Two made from the raw milk of Ayrshire cows are Constant Bliss, a slow-ripened cheese whose name says it all, and Bayley Hazen Blue, deeply veined and rich, with grassy notes. Cabot Clothbound Cheddar, a collaboration with Cabot Creamery, is as good as cheddar gets. When you're assembling cheeses to serve as hors d'oeuvres or as a cheese course, aim for a variety of textures, such as crumbly, smooth, soft, and firm, and a range of flavors, from mild to strong. Some good sources for cheese: Artisanal Premium Cheese (877-797-1200), Formaggio Kitchen (888-212-3224), Murray's Cheese (888-692-4339), and Saxelby Cheesemongers (212-228-8204). This aged tomme-style goats' milk cheese from Consider Bardwell has a buttery texture and hints of hazelnut. Consider Bardwell's youngest, freshest goats' milk cheese is creamy and mild, with a clean, pure-milk taste. A traditional Welsh-style semifirm cheese from Landaff Creamery, in New Hampshire, that's aged at the Cellars at Jasper Hill Farm. It's creamy, mild, and tangy. Thistle Hill Farm's homage to the aged Alpine cheeses of France's Haute-Savoie region. Toothsome yet silky, salty yet sweet, with a subtly nutty flavor. The delicious result of a partnership between the Cellars at Jasper Hill Farm and Cabot Creamery, this traditional cheddar is aged in muslin for up to a year. Blue Ledge Farm's aged raw-milk (unpasteurized) goats' milk cheese is mild and firm, similar to a Gouda. Jasper Hill Farm's raw-milk, bloomy-rind cheese (meaning that added molds ripen it) is aged for 60 days. It is rich, ripe, and milky in the center. Drier than most blues and not nearly as pungent, this natural-rind (developed thanks to naturally occurring molds) cheese by Jasper Hill Farm has a slightly sweet, milky flavor and a dense texture. This semisoft disk is made at Ploughgate Creamery, in Albany, Vermont, and aged at the Cellars at Jasper Hill Farm; the washed-rind cheese (meaning it is "washed" with brine as it ages) has a slightly smoky taste with grassy, herbal accents.